A Tonk's Tail... err, Tale...: Saturday PhotoHunt: ZAP! Merci! Et oui, Maxie travaille tres dur pour papa! Adorable picture for the scavenger hunt. I´m sure would be a purrfect IEEE , Maxwell ! My little guy is very helpful too. He must be involved in everything I do. FaRADaY: well, that's the way it should be. Of course. We kittehs are pawesome snoopervisers! No pockets... plus, do you really want the responsibilty of being an IEEE member, Maxwell? It could cut into nap-time! oooops! Sounds like there might have been CHEWING involved! I imagine the current was turned off at the time... but it still gave me a start! Maxwell, that electrical stuff is dangerous - not a good profession for a kitty! Yes, momma took care of it purrsonally. Not that she didn't trust papa. Really. hahaha! That's a GREAT zap photo! You know...us kitties should do something about this pocket dilemma. Just think of the cool treats and trinkets we could carry around with us. Oh wait, that's what we have humans for. My bad. Maxwell: *nods* Yes, I'm rethinking the pocket thing. Would far rather have opposable Thumbs anyway!! The Baby here: I'll carry your card in my flab purse! Stay away from those wires! someone is gonna get, well, ZAPPED! Maxwell, are you doing an electrical apprenticeship with your dad? He's lucky to have such an enthusiastic student. Wow... you might want to leave that to the professionals! OMC that looks pretty dangerous! We think you'd make a great electrician!! Oh dear Cod! Get away frum dere right now!! 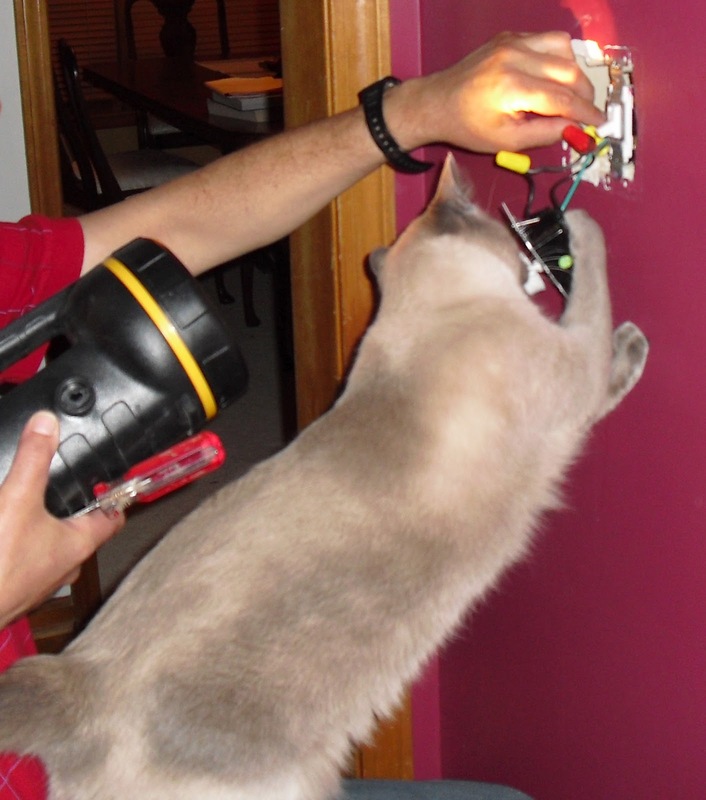 We don't think kittehs should have careers as electricians. We kittehs iz more successful as catpenters or catbinet makers or possibly landscapers. We're sure your Daddy didn't mind you snoopervising, Maxwell! Maxwell, you could get one of those bum bags! Cool! Me likes to helps around the house too! Like sleeping in the middle of the bed when it is being made, refusing to move when the vacuum is on and playing with Daddy's tools when he is trying to fix things!